Tuning up the guitar is simple! It's called tuning up because doing it this way locks more tension in the strings, lengthening the amount of time they stay tuned. It's best to tune your guitar every time you pick it up. No amount of charisma or harmonic genius will save you from a poorly tuned guitar! There are many ways to tune up the guitar, but as this is a beginner lesson, we'll first be looking at the physical aspects of peg tuning. Now take a look at the diagrams below. 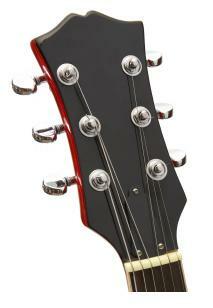 If your guitar has tuning pegs on both sides of the headstock, each side will be different. For pegs on the left, turn the peg towards you to tune the string down, turn the peg away from you to tune the string up. For pegs on the right, vice-versa. 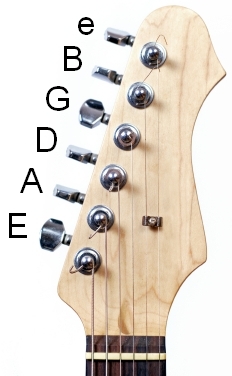 If all the pegs on your guitar are on the left side, turn towards you to tune down, and away from you to tune up. For left handed guitars, it's exactly the same - for pegs on the right side, turn towards you to tune up and away to tune down. 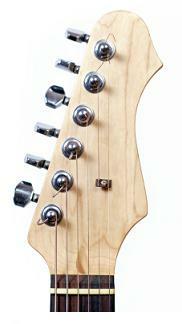 For pegs on the left side, turn towards you to tune down and away to tune up. Every time you tune a string, get into the habit of tuning it down first, then tuning up to the correct pitch. Try not to tune your strings higher than their standard pitch as too much could cause them to break. So that's: fattest string > E A D G B e < skinniest string. However, you'll sometimes hear people refer to string numbers. 1st string = skinniest, 6th string = fattest. 2. Tuning the guitar to itself. That's where the notes of the strings aren't exactly on (e.g. there is no piano or tuning aid to help), but the strings are tuned relatively to each other. For example, number 1 could involve using audio reference, like this online tuner. 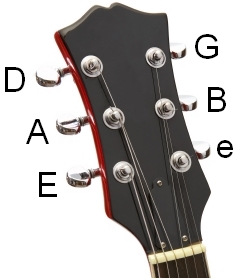 An example of number 2 would be to use the 5th fret method. This method is perfect for beginners who want to train their tuning ear. There's also a lesson on how to tune guitar using harmonics - A more advanced method of tuning, but very accurate and good for fine tuning. Confident with tuning up? If so, we are now ready to move onto actually playing the guitar, learning chords and basic techniques.